Sabal Savings Event! New home is ready for move in. Located in O'Neal Village, an amenity rich master planned community with a warm, close-knit atmosphere. Amenities include a resort-style swimming pool, community fireplace, outdoor amphitheater, children's play area, fitness center, dog park, community garden, two spring fed ponds, and sidewalks throughout the community. 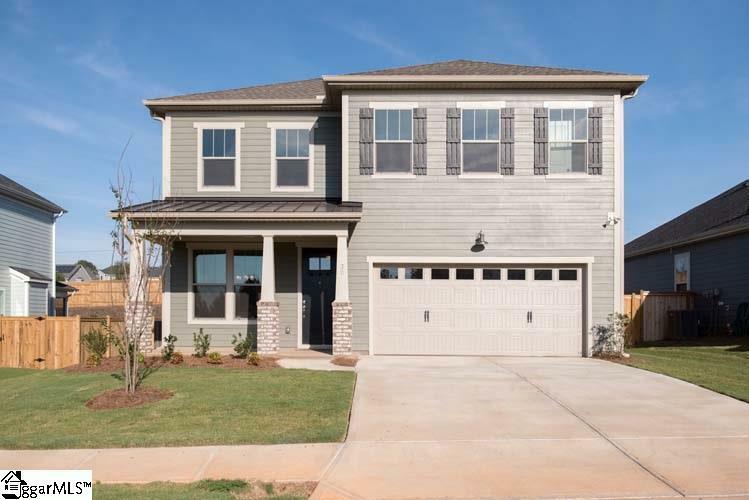 Enjoy the rocking chair front porch from the Keowee plan by Sabal Homes. Kitchen and living room (with fireplace) in one large, open space with a covered porch off the back that's great for entertaining. Kitchen has granite countertops, upgraded cabinets, and an upgraded gas stove. Wood floors throughout the main level living areas including the entry, dining room, living room, kitchen and powder bath. Master on main with a large walk-in closet, trey ceiling, separate water closet and linen closet in the bath. Dining room boasts a coffered ceiling and has a butler's pantry with granite countertops. 2nd floor includes 3 additional bedrooms, 2 with walk-in closets, a loft, and 1 bath. Larger than normal energy efficient windows on the main level let in a ton of natural light without the heat or cold. Tankless gas hot water heater and radiant barrier sheathing for energy efficiency.